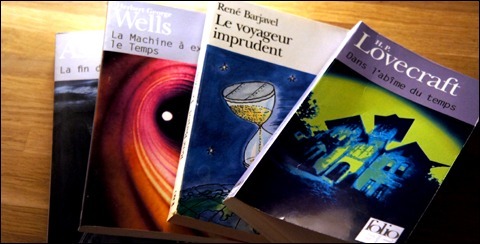 Le voyageur imprudent, Rene Barjavel: Here's a quite unknown masterpiece of science fiction and time travel. The inimitable style of the author, licked, accurate, substantiated, sometimes terribly realistic but also sensitive and nourished with details delivers a great novel. The traveler uses chemistry to move in time. The temporal paradoxes are striking and the end of the book is simply fabulous. The Time Machine, HG Wells: This is a great classic, adapted twice for the cinema and arguably the most famous work on this subject. An inventor creates in this workshop a machine that allows to travel through time: the mechanical process is here! This adventure goes far more in the future, and discovers how the world has changed hundreds of thousands of years later. The end of eternity, Isaac Asimov: A very complex and scientific book. In the distant future, time travel has become commonplace and real state organization now exists around this technology. The topic is here addressed in a simplistic expression, through some good arcade/action games in the eighties and the nineties, but also in a few excellent adventure/RPG games. Hundreds of games were made using the time travel theme, but I will only speak of the few ones I know to be good or excellent titles: because many were not good softs, while yet being adaptations of great movies: one can only think about the Back to the Future games! But also a bunch of mediocre creations not demonstrating a lot of imagination or gaming qualities. Best, only the best! In the 80's, we clearly distinguish three segments of the video game market: arcade games, always at the forefront of technology; the home systems, boasting some exclusive title and ports of arcade games; and finally, the 8-bit computers. On these machines, there were more role-playing or adventure games than on consoles or arcades, that were dedicated to platformers, Shoot em Up, Beat them Up and VS fighting games. It's back in 1987 that appeared the first notable games based on time travel. 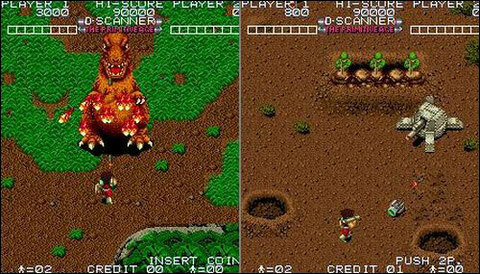 In arcades, Romstar release Time Soldiers, the ancestor of Ninja Commando: it's a Run'n'Gun using a vertical scrolling, sending one or two players save their compatriots lost through time: prehistory, Rome, World Wars, the future... The time travel is here a primary element of the scenario more than gameplay, since it's only used as a pretext to offer different enemies and backgrounds. Passengers of Time, made by Ere on Amstrad CPC 6128, was released the same year: here it is a role-playing game, where all the adventure is based on the time travel... Nice try: an interesting game, taking and deep... despite the very limited technology of the system! and the Passengers of Time, a sympathic adventure that will solicit your brain! A wide range of quality titles, in the same line as the Passengers of Time, came out on 8-bit computers in the late eighties. Era and Lankhor were two great editors of the genre, and the fourth dimension was a recurring theme in their creations, as for example in the excellent Sram games. Explora, also known as Chrono Quest, is a video game saga whose first episode was released in 1988 on PC, ST and Amiga. Still in the Point'n'Click genre, three sequels were made and proved to be excellent adventure softs, very addictive, in which time travel create real puzzle situations.